* Regular readers may, by now, be familiar with my obsession with the lesser told, quirkier stories from history in general and Irish history in particular. And so I've long be interested in the story of Captain Jack White. A hero of British imperialism, turned radical socialist, then anarchist, a man who lent his life to a series of lost causes. A man who was, in his own word, a misfit. * A handsome man with an unmistakeably military bearing. Dressed in civvies but holding a rifle. Captain James Robert White, always known as Jack, is largely forgotten in Ireland, Britain and Spain now. But for a long while, he was at the centre of great events. Through his life, he believed in socialism and the collective cause and destiny of the working classes. And he believed in their right to organise, arm, drill and fight. It was Jack who organised the Irish Citizen Army, after seeing the strikers in the 1913 lockout - the bitter struggle between the unions and the employers - getting knocked about by the police and strike-breakers. White - who by then had left his official soldiering days with the British Army far behind him - saw the need for a disciplined force, a Citizen Army that could, as he said, "put manners on the police". White was the true born son of the Empire, He was born in 1879 on the family estate in Co Antrim in the North of Ireland, the only child of a full British Field Marshal - Sir George Stuart White VC, GCB, OM, GCMG, and so on. Sir George had won Britain's highest military honour, the Victoria Cross, fighting the hill tribes in Afghanistan, in the year his son was born. Jack was educated at Winchester (from which he was expelled) and the Royal Military College at Sandhurst. He began his fighting career aged just 18 with the Gordon Highlanders fighting the Boers. And he was awarded the Distinguished Service Order for an act of great bravery and initiative. However, it was also in South Africa, during that bitter war, that Jack first showed signs on a very un-imperialistic streak. During one furious battle (as he later recalled), a 17-year-old soldier in White's section lost his nerve and stayed shivering in his trench. A senior officer called to the young Lieutenant White; "Shoot him!". When Jack did not move, the officer moved towards the youth with his own side-arm out. Jack is said to have drawn his gun, covered the officer and coolly told him; "Do it - and I will shoot you". There was further some service with the army in India, but it seemed Jack White and the British army were destined to have a parting of the ways. He returned to his native Ireland and became interested in radical politics, then a huge draw to many young members of the aristocracy with questions. He dropped out of society, travelled to Canada to work as a lumberjack, taught in various schools and joined a radical commune influenced by the writings of Tolstoy (Jack actually wrote letters to HG Welles and Tolstoy to explain his new course in life, Tolstoy is said to have written back approvingly). The commune, in the English countryside, also welcomed practitioners of Free Love. It was pretty radical stuff for the son of a full British Field Marshal in the 1900s. It was this romantic search for something new, something better, that eventually brought him to Dublin, where he met with the Scottish born, Irish socialist leader James Connolly. The two men, who could hardly have been from more different backgrounds, struck up what became a very strong and enduring friendship. White got caught up in the labour battles around the time of the 1913 Lock-out. He saw the ranks of the union men broken up by police batons and decided it was time for them to fight back. 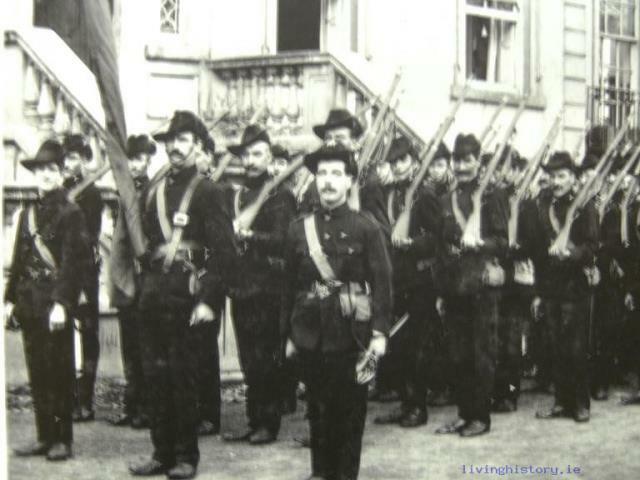 White organised, drilled and commanded the Irish Citizen Army. Which would go on to fight in 1916. White did not fight in 1916. He had been organising a Volunteers brigade in Derry, but was very disillusioned by the sectarian, anti-Protestant views he encountered there. He also managed to fall out with his fellow protestants who put sectarian beliefs before the unity of working people. It was to be a motif throughout his life. It seems that Jack White was always on the search for purity of belief and deed. And he would always be disappointed in his fellow men. Those who put nationalism, religion, class prejudice, a thirst for power or control, above what he saw were the simple tenants of socialism. When he appealed to the Irish Volunteers for unity with their fellow protestant workers, they often accused of him "looking out for his own" and questioned his commitment to the glorious cause of Irish freedom. But White could be just as difficult with his fellow Protestants he believed that true Protestantism should be behind those who wanted a better, fairer world for all. Not just Orangemen and the sons of land-owning British Generals. To the Protestants, he was always a "Shinner". To the Republicans, an Orangeman, a toff, ex-British Army and the son of a General. Not for nothing did White call his autobiography, written in later life when disillusion had largely taken hold; "Misfit". When Connolly (his great friend) was sentenced to death after the Rising – White tried - in vain - to organise the Miners of Wales to go on strike to save his life. He later travelled further to the left, joined with Sylvia Pankhurst’s Workers Socialist Federation in England, organised a communist republican group in Ireland in the 30s before joining the anarchists in Spain during the civil war. Jack White volunteered for the Red Cross in Spain and helped organise the Connolly Column and was thrilled to see Irish protestants and Catholics, all socialists and communists, fighting together for the people. He also distributed handguns to the women of towns and villages around Madrid and drilled them in how to protect themselves. White may have been high-minded in his politics but he was always a practical man. When a fascist is advancing on you, better to have bullets over banners. Once again, White eventually became disillusioned with the in-fighting and betrayals, becoming avowedly anti-Stalinist and leaning more towards the Anarchists, the only keepers of the pure flame. In this, he was following a similar path to George Orwell, another ex-Imperial policeman. He returned to the family home in Co Antrim, shortly before the outbreak of the second world war. There was a brief reappearance in Public life when he tried to stand as a "Republican Socialist" candidate for Antrim in the 1945 general election, but by then those who knew him at all regarded him as little better than an eccentric, rowing pointlessly against the tide of the times. Jack White died of cancer in a Belfast nursing home in 1946. His family, embarrassed by his revolutionary past, burnt almost all his papers and writings shortly after his death. He was a remnant of a strange, romantic, heady time, when many upper-class English men and women, bred to Empire, decided on a radically different course and fought for universal socialism and the rights of every man. In his beliefs, he was a radical, a puritan, a believer in the essential brotherhood of men and their desire for a just and equal world, He believed, passionately, that you only had to give people the means to fight and the cause to fight for and they would follow. He was destined to be disappointed. In the end, disowned and hated by Republican catholic and protestant unionist, Jack White was, as his own epitaph said, the eternal misfit. A true original and typically ornery Antrim boy!